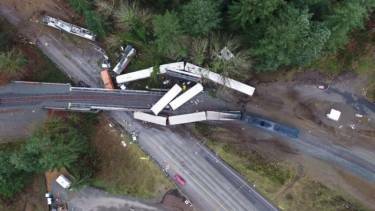 In December 2017, an Amtrak train traveling from Portland to Seattle derailed during its maiden voyage on a new section of track over an I-5 bridge leaving several cars dangling and severe damage to the bridge. The crash killed three and injured 70 while traveling 78 miles per hour in a 30 mile per hour corner when it derailed at the bridge. Portland Bolt was called upon with its 106 years of bolting experience to provide the bolts to secure and deliver all the fasteners for the bridge over Interstate 5 the next business day after Christmas. We were able to procure and deliver all the fasteners in time including having an employee drive up on a Saturday to hand deliver several boxes to the construction crew near the site. Portland Bolt showed its ability to provide excellent service and unparalleled dedication to accommodate even the most demanding bolting needs in a timely fashion. All certification documents were emailed immediately as the order shipped to ensure no delays on the job. We have proven time and again that we are willing to go the extra mile, or 150 in this case, to ensure your job is completed on time.